There was no heartache inside Wells Fargo Arena as the Eagles brought its ‘History of the Eagles’ to the Midwest last Saturday evening. “It’s good to be back in the heartland,” guitarist and singer Glenn Frey said to the sold out thousands who packed the arena. The tour, which is designed around the Eagles documentary of the same name, gives concert-goers the real life experience of the history of the Eagles. It starts at the beginning of the band’s inception and dives chronologically through the weaves and turns of the band’s highly-acclaimed career. Drummer, guitarist, and singer Don Henley joins Frey in discussing how many of the band’s songs came about and how the songs evolved over time. It’s not just a show, it’s a rock ‘n’ lesson of a lifetime. Henley and Frey open the set with an intimate setting — just the two of them, a pair of acoustic guitars, and a room full of anxious people. The two play early numbers the likes of “Saturday Night,” “Train Leaves Here This Morning,” and fan-favorite “Peaceful Easy Feeling.” Longtime and formerly estranged guitarist Bernie Leadon joins the band to the crowd’s pleasure — capping off this intimate setting being produced. It’s in the early numbers that the crowd knows it’s in for a night to remember. The way the trio takes the arena and turns it into a setting so intimate that they could be playing in your basement is unforgettable and irreplaceable. It’s the type of atmosphere that takes decades of playing live to create. The tempo of the show picks up when the band bursts into a unique rendition of “Witchy Woman,” a song that has aged like very few are able. There’s a collective intake of breath from the crowd when American rock ‘n’ roll legend Joe Walsh walks on stage to join the band. Walsh is the type of guy who oozes that legendary aura worthy of McCartney, Page, or Dylan. All eyes fall to him as he sends a wave of excitement from front to back — everyone knows the best just walked on stage and the energy is about to change, tenfold. The band took unique twists on “Witchy Woman,” as well as “Heartache Tonight,” creating unique vocal and instrumental arrangements strange to the audience. It kept us on our toes and provided flavor to the set. The first half of the evening consisted of the band’s best singles from its early years; “Lyin’ Eyes,” “One of These Nights,” and “Take it to the Limit,” sent the crowd into the fifteen-minute intermission of what was a 3-hour, 27-song evening. His solo material proved to be genius and one-of-a-kind, even decades later. He interacted with the crowd through cameras and call-outs the way Walsh only knows how. He is simply a legend. The Eagles’ material proved the same timelessness in Des MOines last Saturday. The one thing to take away from the entire night is how well the band’s material has aged. One could argue not even The Beatles have transcended generations the way The Eagles’ music has done. It’s as though you could close your eyes and be sent into a time portal into 1976. Henley’s, Frey’s, Walsh’s, and bassist Timothy B. Schmidt’s vocals are as a perfect as that day when those records were tracked. No band has aged better — the show doesn’t slow down or lack energy from the men who are well into their 60s. Fans could close their eyes and hear music that sounds exactly as it does on the record. It’s something no other act on this planet can rightfully achieve. The perfection is utterly unique and breath-taking. See The Eagles while you still have the chance. The live show has improved over the years, if anything. The set closed with a an encore that sent shivers down my spine. The greatest American rock song ever written, “Hotel California,” lit the room up before Frey took it away with “Take It Easy,” and Walsh respectfully shredded one last time to “Rocky Mountain Way.” Henley came out holding the mic and belted the band’s greatest ballad, “Desperado,” to close the set and there wasn’t a dry eye in the house. It’s the kind of song that taps into your deepest emotions and doesn’t want to let go — it’s the type of song that has the power to change lives. A rightful ending to an unforgettable night. 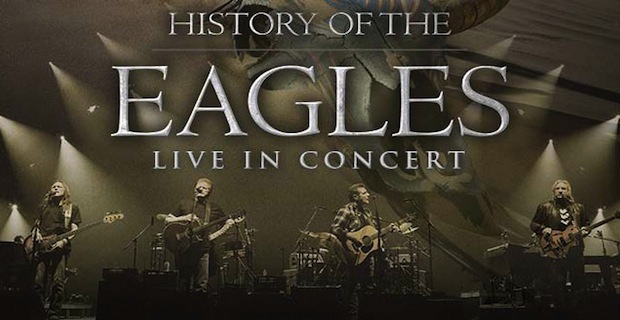 Check out the rest of The Eagles’ ‘History of the Eagles’ tour dates and purchase the documentary today.